Television, with the exception of direct-response ads and home shopping networks, has long been perceived as being at the top of the so-called “marketing funnel,” but is increasingly being valued for the lower end, thanks to increases in digital backchannels and data. That’s one of the significant findings from a new report from ad industry B-to-B researcher Advertiser Perceptions. 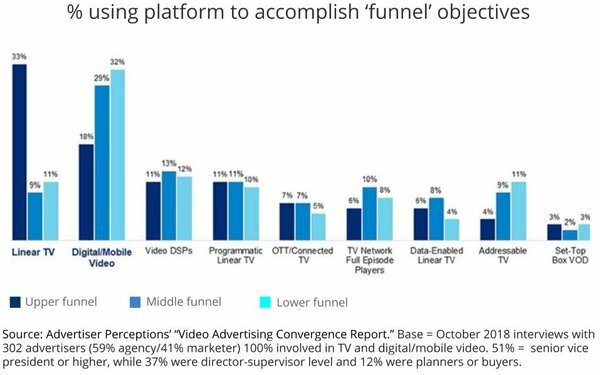 The just-released edition of its 2019 Video Convergence Report finds that marketers and agency executives increasingly are utilizing advanced TV platforms for lower-funnel functions such as sales, conversions, leads and other actions. While the majority of ad execs interviewed by Advertiser Perceptions late last year still utilize linear TV advertising mainly for upper-funnel functions like generating awareness and positioning their brands, they said they are using over-the-top video distributed via computers, connected TVs and mobile devices more for lower-funnel performance. The same is true for addressable TV, although it’s still a relatively small part of the overall TV/video convergence mix. Regardless of the strategy, the report also indicates that there is continuing broad-based demand from marketers and agency executives for utilizing TV and video advertising. 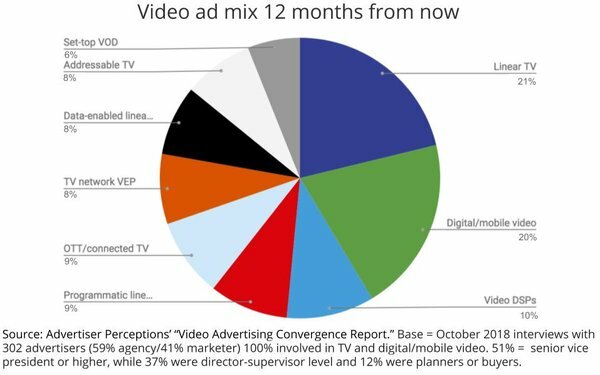 While the study shows overall stability in video budgets, the share being allocated to linear TV is projected to decline two percentage points to 21% with the main beneficiaries being OTT/connected TV advertising and addressable TV advertising, which will each pick up a point over the next 12 months. 1 comment about "A Funnel Thing Happened On The Way To A Converged Video Marketplace". Ed Papazian from Media Dynamics Inc, February 7, 2019 at 6:19 p.m.
Joe, if the percentages of ad spend shown in that last pie chart reflect the nature of the sample for this study---which is probably the case---then it is not close to being represenative of all TV/video advertisers nor are the findings weighted by the amount of spend. It's really hard to accept the idea that "linear TV" will get only 21% of the dollars next year. Perhaps a better way to look at such research is on a trending, not an absolute, basis, again assuming that the respondents are similar in composition from one year to the next.